Ever wanted to own a Lamborghini Gallardo supercar? Well, now you can thanks to Readies.co.uk – a loan comparison site run by football fans! 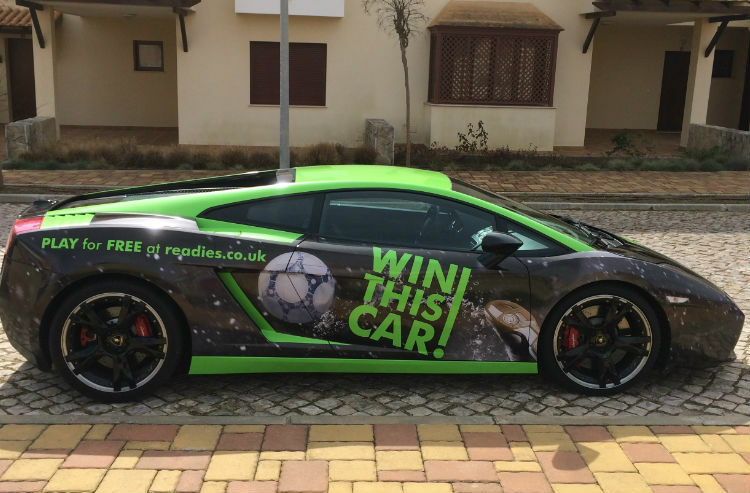 Readies.co.uk runs a free football score prediction game week in week out where you can play along, completely free of charge, no entry fees or dodgy subscriptions for the chance to win a Lamborghini! In order to win the car, you have to successfully predict the outcome (correct scores) of 10 football games. To make things a bit easier, that figured is lowered to 9 correct scores if you share the game via Facebook or Twitter. You help them, they help you! Obviously predicting 10 or even 9 correct scores can be quite a challenge with the unpredictability of the English Premier League but the car is not the only prize! They also offer a flat £1,000 cash prize, completely free to the person who gets the closest week in week out. The prize has been won several times by people who have as little as THREE correct predictions out of the 10. This obviously raises your chances of coming away with the prize massively so we think it’s well worth an entry. Entries and sign ups can typically be taken from a Sunday evening right through to 30 minutes before kickoff on a Saturday. This gives people 5 days or so to have a think on their predictions and get their entries in. Once the first game kicks off, the game is locked from entries until the end of the last match in the list. A new game will then start immediately afterwards. If you want to play along all you have to do is sign up at https://www.readies.co.uk/win/ - completely no strings attached and even if you don’t win it’s extremely fun to play along and see how you compare against other players. During the matches, they feature a live scoring app where you can see your own entries along with how many players are left in the running for the main prize! The competition itself is provably fair and as soon as the current game closes before kick off a downloadable spreadsheet is made available of all players in the current game and their entries. No personal information is divulged but you can clearly see how all the other players see the game going. Anyway, take a look at their site and if you think you know your football why not play along.